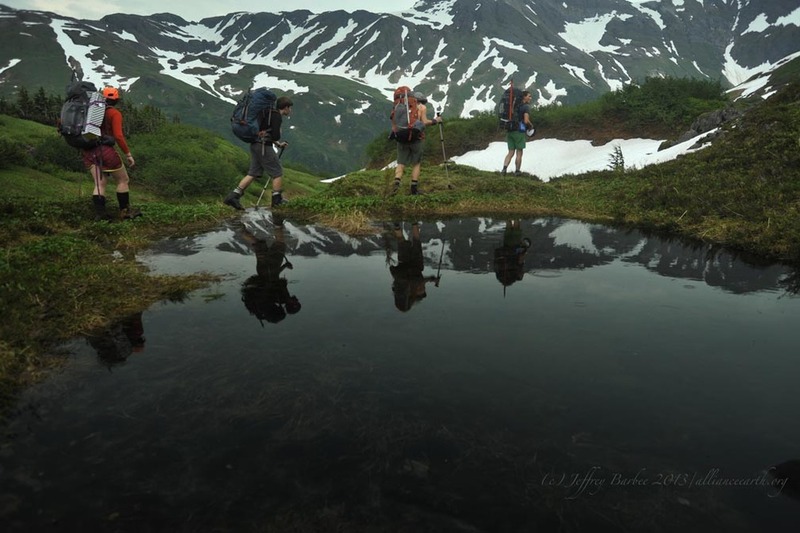 After almost two weeks of hot weather in the Juneau area we had an extremely rare experience for Southeast Alaska, on the long trek up to Camp 17, the trail wasn't a stream! Our hike up to Lemon Creek Glacier was truly unique. Most amazing was the sunlight that filtered through the high forest canopy as we wound our way up, up, up the valley. The alleged "vertical swamp" that took us up past tree line, was pleasantly un swamp-like and after a muddy mosquito filled trip through southeast Alaska's temperate rain forest we were finally greeted with a refreshing drizzle of rain in the high alpine valleys. Skirting a glacial "tarn" lake, a flash of lightning and a peal of thunder caught us exposed near a ridge. We found safe lower ground and waited out the worst of the danger before heading up towards Camp 17 once again. Climbing the upper Ptarmigan Glacier near camp, the most amazing thing of all were the cloud-free views of Juneau's Auke Bay, the fjords of the inside passage, and the jagged ridge lines that mark the far western edge of the Juneau Icefield. While it was a tiring 14 hour day, we could not have asked for a more amazing introduction to our first research camp.